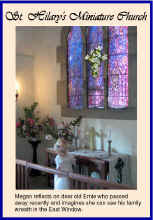 St. Hilary's Current Downloadable Cards, Calendars and St. Hilary's Year Book 2009. Please note that these general use/occasions cards can be used as either cards or notelets as required. Each prints on to A4 paper and double folds into a notelet/card. y.
Miniature 1/12 scale cards and 2010 calendar. Inside is left blank for your own message. Inside is left blank for your own message. Inside reads: "Thinking of you" Inside reads: "Thinking of you"
ST. Hilary's Church Monthly Calendar version 1 for 2010 is a pdf file - to be printed on A4 paper. Notes for printing this version of the calendar: The cover page is to be printed separately. The rest of the pages ie 2-26 are to printed back to back/upside down so that each month the calendar is hung to show TWO pages - monthly picture on one page and calendar on the other. Plastic comb/wire binding works well and a hole needs to be punched at the bottom for hanging purposes. Please also note that although the grid lines are not always visible on the screen they DO print out correctly! St. Hilary's Church Monthly Calendar version 2 for 2010 is a pdf file to be printed on A4 paper - this is an A4 calendar with photo and calendar per A4 page for ease of printing. NOTE: This book has all the main stories which featured on St. Hilary's website during 2009 whilst also including some stories and events from past years. Each instalment is approx 2 - 4 meg size. Miniature 1/12 scale St. Hilary's Cards and 2010 Calendar. 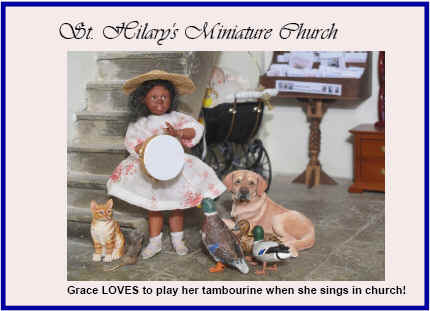 Download our pdf file which has a copy of each of our current greetings cards and 2010 calendar......ALL in miniature 1/12 scale for your very own "little poeple in your dollshouse! Right click the "Download" and save the file down or open in a new browser window.